Now I know how celebrities feel during “Awards Season.” : ) I am delighted to have received another blogger award by the sweet and lovely Abby of Eat Healthy Be Happy. 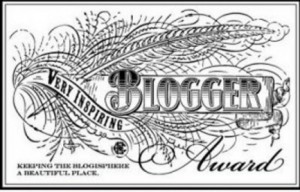 I just love the tagline of this award: “Keeping the Blogosphere a Beautiful Place.” I love this because in my case, the blog is all about food. Vegan food to be exact. And how true it is that food is not only scrumptious but beautiful as well! Thanks again, Abby, for this very special honor! Be sure to check out her blog for awesome, inventive recipes… for instance, an Apple Crisp Smoothie? Doesn’t that sound delicious? And why have I not heard of that before? That’s because Abby gets things done in the kitchen. Wonderful and delicious things. Check it out and enjoy! The Heebavore: Veganism and Judaism, together for the journey. Truly inspirational! Haute Ahimsa: Delicious food. Compassionate, creative person behind it all. You’ll fall in love. One Funny Motha: The title says it all. Be ready to pee your pants. 1. My childhood nickname was: Oh, I had a ton. I’ll choose to share one. Shabba. Shabba Ranks to be exact. 2. If you want to spoil me rotten, buy me: An embarrassingly large gift card to Sur La Table. 4. If I had a whole day to go shopping and money to spend, I would go to: Sur La Table. I thought we established that. 5. The most wild and crazy thing I have ever done (that I can admit to publicly) is: Give birth to my kids. Good, for sure, but wild and crazy too. 6. The one thing on my bucket list that I am most eager to do is: Rent a villa in Italy for 6 months minimum and just cook, eat, read, create and play music. 7. My family will always be loyal to: Stretching and exploring our faith. We are a Christian family that believes God wants us to use our hearts, our hands AND our brains. 8. If I could spend a day with a celebrity I would choose: Seth Rogen. 9. In my opinion, the best invention in the history of the world is: The wheel. 10. When life hands me lemons, I make: A stink. And then I wipe myself off, make some lemonade and add a ton of sugar. Aww. I don’t even now what to say. I guess thank you would be appropriate. So thank you, kind laurenlisang. I love you, and I always will. Congrats on yet another beautiful award! yeah to you & your lovely blog! Congrats on the others too! 🙂 On question 6: I completely agree!